At Foundation Supportworks, Inc., we take pride in the lasting quality of each of our installations. We stand by each PowerBrace™ installation with our 25-year warranty against manufacturing defects, as well our installation warranty. At Foundation Supportworks, Inc. we want to help you restore your bowing, buckling, tilting, or shifting foundation walls back to their original, structurally stable condition. To help you decide if we're the company for you, we offer free foundation wall repair quotes throughout our Texas service area. 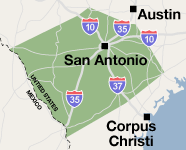 We proudly serve Victoria, San Antonio, Laredo, surrounding areas such as San Marcos, New Braunfels, Del Rio, Eagle Pass, Kerrville, Beeville, Seguin, and many other parts of TX.